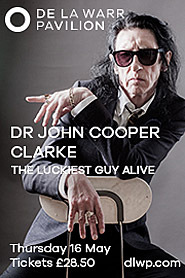 On 4 April John Napier, known as John the Cobbler, died after a long fight against cancer. 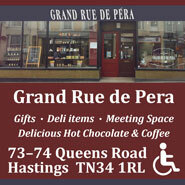 His shop at 64D High Street was known as the hub of the Old Town, to people and dogs alike. John’s funeral service was held at the Opus Theatre last Thursday, 26 April at 1pm. HOT’s Chandra Masoliver writes. 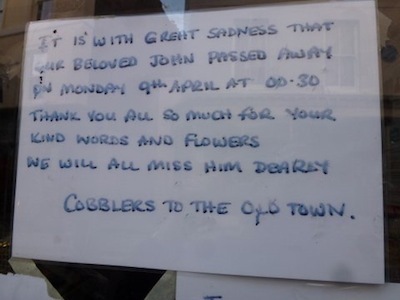 John the Cobbler has left sadness in the hearts of many people. He was a joy to know and he is irreplaceable. He was a good cobbler, cut keys, hosted our dry cleaning as a collection point and allowed GWC window cleaners a base there. 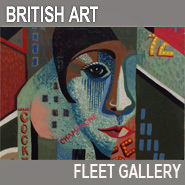 In his shop there were countless leaflets about local events, tickets could be bought and collection boxes donated to. Anyone might have done all that, but it was as a human being that he shone. Right through his long illness whenever he was well enough he would be in his shop. 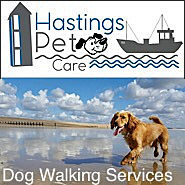 All dogs were welcomed – and it was through my dog Liza that I got to know him as well as I did. Walking up High Street, head down, deep in thought, I would suddenly be lurched to the left and into his shop we would have to go. While talking with me, he would equally share himself with Liza, feeding her little bits of treats, slowly and lovingly. He had time for all of us. 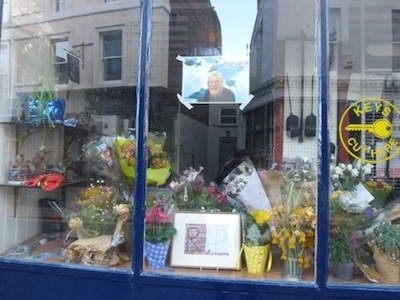 After his death flowers and photos and tributes piled up in the window and outside the shop. 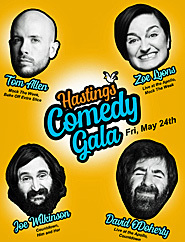 In the words of his friend Harris Woodcock (Hastings Independent Press 20.04.18) “There are very few people here who have not been touched by his generosity and kindness, so many that remember having a laugh or sharing a drink with him at one of his famous Saturday afternoon gatherings. “He transformed our favourite shoes and boots into shining items that could be worn again, even if we ourselves thought they were beyond repair. He was there when we locked ourselves out or lost our keys, even if that meant locking up shop himself. He was there when you needed a seagull rescued from your chimney or anywhere else – he got it safely to the RSPCA, even if that meant smashing up your wall. On Thursday 26 April the sun shone strong on his funeral procession along High Street and George Street. 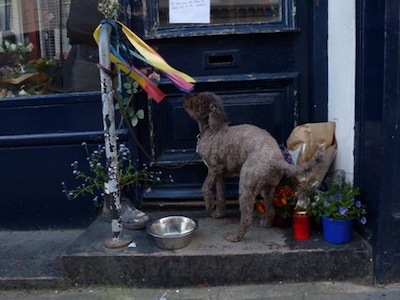 Many people, and a good smattering of dogs (my Liza included), made their way to the Opus Theatre, some stopping for a pint or a snifter in his honour on the way. The Opus was full. On top of John’s coffin was the giant shoe that hung over his shop, it was full of flowers, and nearby was a photo of Himself. The ceremony started with ‘The Road Back Home’, beautiful music, composed for John by Polo Piatti. Then his friend Jonathan, a Humanist Minister, told how everyone went to his shop, for laughs and for broken hearts, and moans and rants – and he’d join in with his own. He said the keys John cut didn’t always fit and he made all the dogs of the town overweight; that if you took your shoes in on a Monday you’d be told they’d be ready on Wednesday, but you’d ask him “Which Wednesday?” He told us of John’s love of music, that three songs he liked were about souls, soles, and arseholes! And that he thought Hep B was a vitamin pill. He said business came second to John’s social life, and that he is proud to have had John as a friend, that he feels gratitude as well as pride, because John was so unique. It was a privilege to know him, and he will always be with us. Andy Neate played the guitar, and then John’s elder brother filled us in about John’s youth in Glasgow: he started cobbling at the age of twelve; later he played in a band, and had long hair. When asked where it had gone now, John said “Under the bed in a box.” He said John’s customers were his friends, and his friends were his customers. Jenny has been friends with John and Sandra for fifteen years, they met when she went to have a key cut, and they were chatting so much he cut it right through! She suggested a Memory Book, and that people could email their memories to jennypablo@gmail.com . Glen Veness showed a video of John and himself, and said he’d wept as he wrote of John’s wit and his bravery. 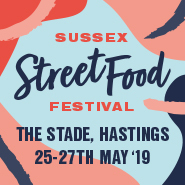 Then Liane Carroll sang and played a song about Hastings, Old Town and the seaside, returning every year “same time, same place”, with a chorus, “Come kiss me quickly”. Finally Bruce Nicol, friend and fellow Scot, paid tribute to John’s partner Sandra and to Lindsay; and to friends Paul and Samuel who were always there, to drive him to hospital any time of day or night. He said that John is free at last from pain and stress, that he will never be forgotten, whenever there’s a worn out soul/sole – that he was a peacock among pigeons. Afterwards, as was totally appropriate, those who wished adjourned to the East Hastings Sea Angling Association, and who knows how long that celebration of his life lasted?! 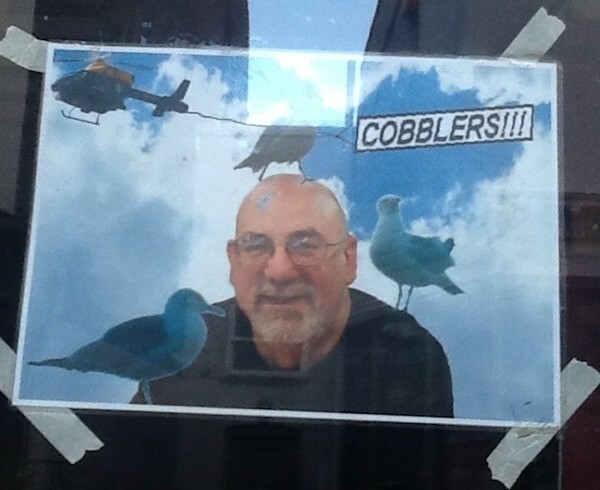 Brilliants tributes to John ‘the Cobbler’ Napier, so well deserved of that lovely man who inspired all by his fight with and contemptuous attitude to his cancer. Just another voice, expressing sincere condolences to his family. Lovely article, Chandra. 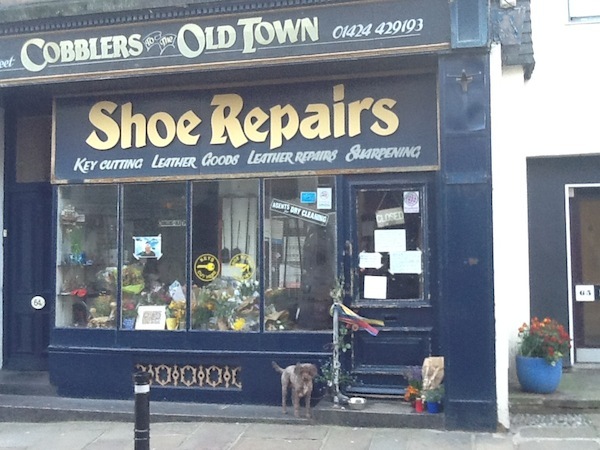 I’ve never lived in the Old Town, but John the Cobbler fixed my boots when no-one else knew how. His shop was like a bar with shoes instead of beer passing over the counter. Three cheers to John! 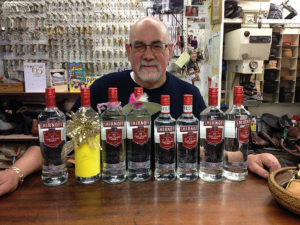 « Bavard Bar celebrates first birthday!